Travelling can be one of the most rewarding experiences you can give yourself! But, like everyone who has caught the wanderlust bug knows, it’s not always glamorous. Many well-intentioned adventures, especially if you are going it alone or venturing off the beaten path, come with their fair share of challenges and stresses, and keeping your mind and body in good order is one of them! If the worst comes to the worst, we at London Doctors Clinic are always here to help pick up the pieces of post-travel maladies and our private doctors regularly treat patients with all forms of post-travel diarrhoea, rashes, sunburn – you name it, they’ve seen it! Vaccines can’t protect you from everything and your behaviour is important too! 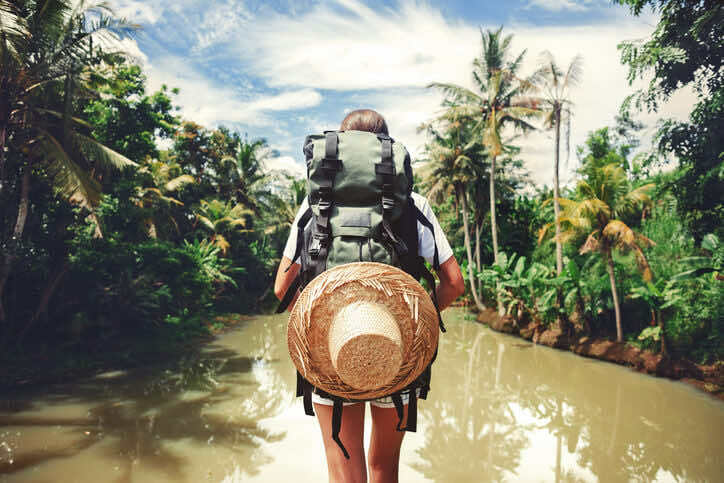 Thankfully, you can benefit from the many tips and tricks picked up and passed on by those who have gone before you (and the doctors who they saw afterwards) to help you stay safe and well on your travels! One of the major sources of ‘an upset tummy’ on holiday is unclean food and drink. If you don’t fancy the idea of being laid up with a dose of the dreaded travellers’ diarrhoea, you want to ensure you stick to safe food and water habits. While you might want to immerse yourself in the local food culture, sometimes you do so at your peril! Choosing food cooked hot, hard boiled eggs, and fruits and vegetables washed by yourself will cut your risk of food poisoning, as will avoiding food that is raw or undercooked, food from street vendors and unwashed or unpeeled fruits and veggies. Bugs (think mosquitoes, ticks and fleas) are rife in some parts of the world, and spread a number of unpleasant illnesses. To prevent bug bites, you can talk to your pharmacist about the best bug repellent option for you. Other great measures, including covering up your skin, using a bed net if sleeping outdoors, or sleeping in air conditioned or screened rooms, will further reduce your risk of bites. There are many general measures you can take to ensure minimum germ transfer between you and your travel companions. Regularly washing and sanitising your hands is one of the best means of getting rid of those little nasties. Other tips for maximum germ busting impact include avoiding contact with people who are sick, showering daily, and covering your mouth or nose with your hand when you cough or sneeze! Limit alcohol consumption – this means limited bad judgement! Swim in designated areas where there is a lifeguard present! This is especially important if you come into contact with animals in their natural habitat. Most wild animals will avoid you, but some will attack if they feel threatened or are protecting their territory from unwanted visitors! If you are bitten or scratched by an animal, wash the wound with soap and clean water immediately, and make arrangements to attend a local doctor for more advice. Before you leave on your trip, review your health insurance plan and determine exactly what medical services it will cover – this is a (boring) job worth doing. You may even need to add extra cover for your trip. Remember to pack any regular prescription medications along with your flip flops and sun cream! You can also consider bringing a stock of over the counter medications to treat minor complaints such as nausea or diarrhoea. Consider carrying an identity card showing your blood type and the name of any illnesses you have, which can help in an emergency. If the worst happens and you do fall ill and need medical help abroad, carrying a list of local doctors and hospitals can speed access to health care along! Our last tip is to use the same common sense when travelling abroad that you would use at home, and always stay alert and aware of your surroundings. Travelling to a new country should be a fun and exciting time, but remember that tourists can be especially at risk of crimes such as mugging and sexual assaults. Not all countries are as well protected by local laws and social customs as those in the developed world are. Staying with your group, keeping your drink supervised, and avoiding carrying too much cash can all help to reduce your risk of being targeted. Ensuring that you keep valuables in the locked safe at your hotel, hostel or apartment, and avoiding giving out personal information to strangers are no brainers. Reviewing and writing down the emergency numbers for the area you are travelling to prior to your trip will ensure that you have them close at hand if they are needed. So, there you have it – our 8 top tips for staying safe while travelling this summer. As responsible as you are, however, there is always a chance of unexpectedly falling ill, and should this occur, London Doctors Clinic is here for you! We offer short-notice and even same day doctor appointments with fully qualified private GPs across 12 central London clinics. Fingers crossed your trip runs without any hiccups, but we’re here for you should you need any help or information!